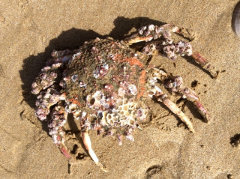 This is one of the larger crabs that may occasionally be encountered, with carapace width of around 100mm. 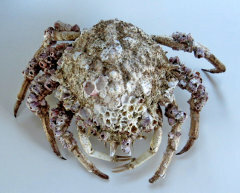 It is the largest of the southern African spider crabs, and can be found from close inshore to at least 100m depths. While the base colour is orange to red, it is usually much overgrown, with the carapace barely visible. The carapace is covered with short spines and bumps, and there is a double-pointed projection between the eyes extending forwards. It is not often seen. For more details on this species, see "A field guide to the Marine Animals of the Cape Peninsula" available directly from SURG or better dive and book stores in Cape Town.